On this blog we have already seen “how to use Ajax Toolkit to mass update records” without writing any Apex code. In this article as well, we will use Ajax Toolkit to add custom button in Account page layout and update record. 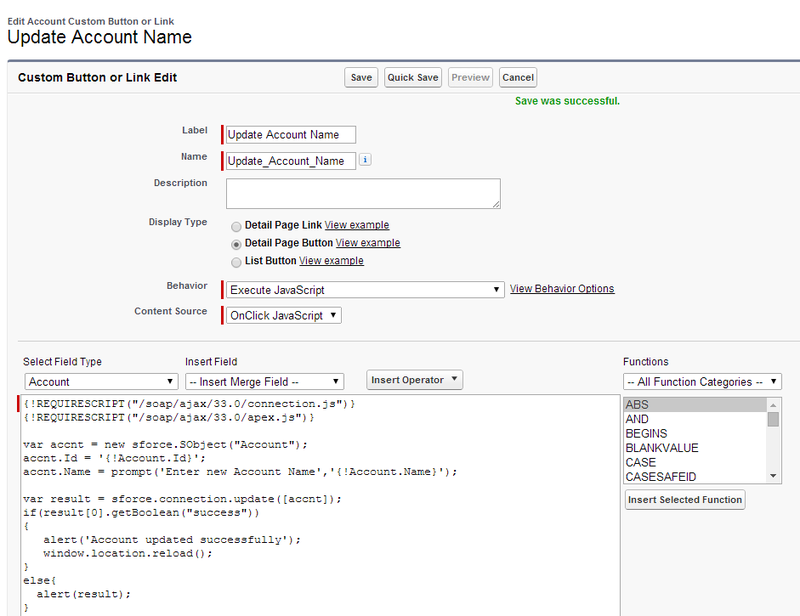 Navigate to “Customize | Accounts | Button, Links and Actions”. Add this newly created button on Account page layout and click on it. It would prompt for new name and will update current record. Do you know a document that describe how this kind of code are articulated. I am brand new in SF industry, i don’t programation much than that only have my admin certif. but this tool seems to be really powerful and really useful for my project to come where i will for instance need to create a button to change a case owner (put it in a particular queue). I transposed your code in the case object by changing every reference to account to the case object but i don’t have any result.